We were called out in September to have a look at Max. 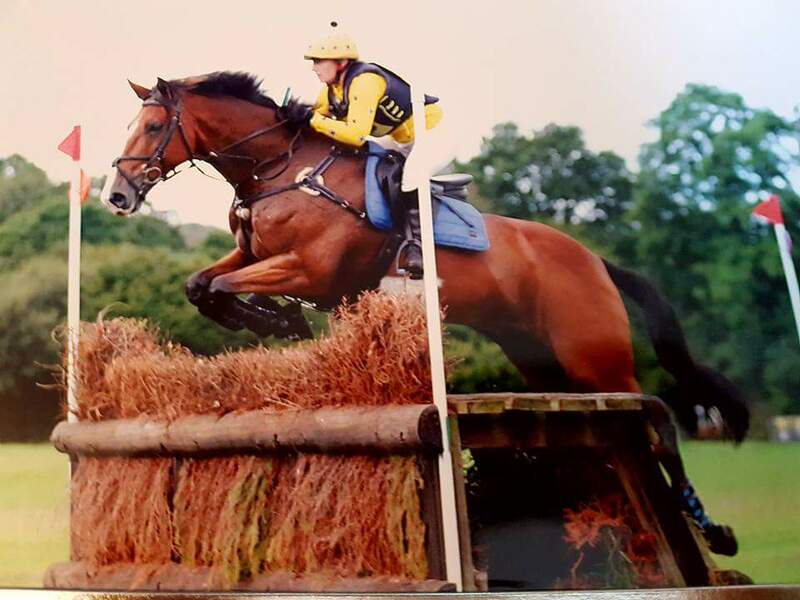 Max is a big Sports Horse eventer who had gone mildly lame on his right front leg. On examination he had a swelling around the tendons, which indicated he could have damaged one of them. Using our mobile ultrasound we scanned the tendons. Unfortunately, this confirmed he had done some nasty damage to his check ligament. The check ligament is actually an accessory ligament which supports the deep digital flexor tendon. It runs from the back of the carpus (knee) in the front leg to about two thirds of the way down the canon bone where it joins the deep digital flexor tendon. On ultrasound we could see it was very swollen (measured much bigger than the one in the opposite leg) and had torn fibres. The most important treatment for any tendon injury is stable rest, anti-inflammatories, cold therapy and bandaging for a couple of weeks followed by continued stable rest and controlled exercise for a number of months depending on the severity of the injury. Tendon and ligament injuries are quite common in competition horses and can result in the end of an athletic career. After three months of diligent care by the owner we re-scanned the check ligament to see how it was healing. Disappointingly, it appeared to have made very little progress despite the very best of care. After discussing options with the owner, it was agreed that we would carry out a Bone Marrow Aspirate Concentrate (BMAC). This is a very modern technique, which is done while the horse is standing up, but sedated. We aseptically aspirate bone marrow from the horse’s breast bone (sternum) using a special needle and ultrasound to guide our needle placement. The horse only experiences mild discomfort during aspiration. The procedure was performed at Max’s home, in his own stable. A mobile laboratory met us there to separate and filter the bone marrow sample, which concentrates the stem cells and growth factors. 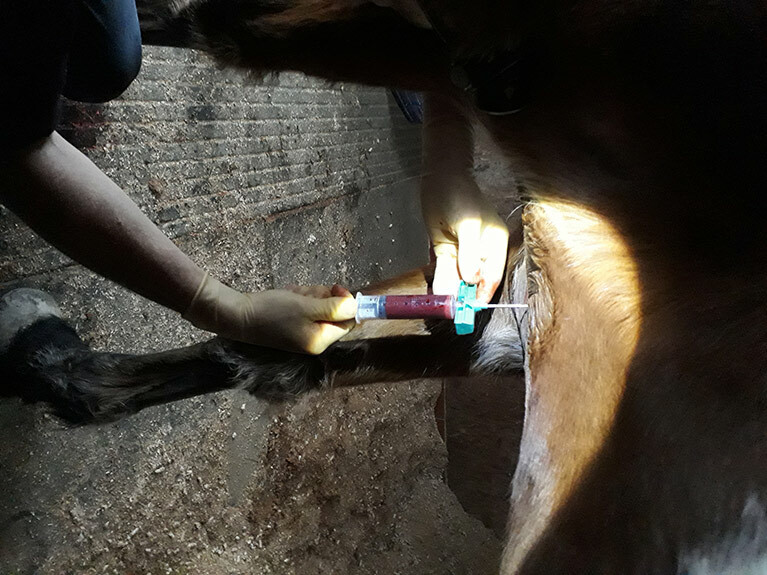 Again, using ultrasound guidance and aseptic technique the horse’s own stem cells and growth factors from the bone marrow were then injected back into the damaged check ligament of the horse. To make this easier and less stressful for the horse (and vet!) we first blocked the nerves supplying sensation to the lower leg by injecting local anaesthetic around them. The stem cells and growth factors should kick-start the healing process and create good quality new tendon tissue within the check ligament. Max has to go back to square one now with stable rest and short amounts of controlled walking every day to allow the check ligament to repair. We wish him and his dedicated owner the very best of luck for the next re-scan in three months!